Travelers gathered at their gate inside Buffalo Niagara International Airport, ready to board Jet Blue's first direct flight to Los Angeles. 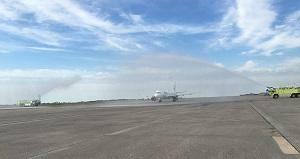 A water gun salute welcomes first direct flight from LAX. 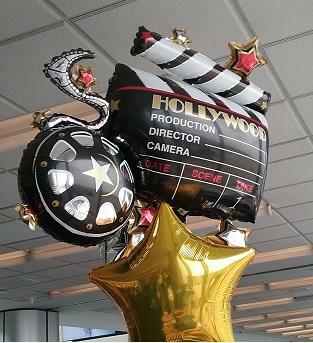 Western New York Film Commissioner Tim Clark is among those who see the benefits of the new service. "What this does is it allows a crew, producers, directors, also cast to move in and out of LA very easily to Buffalo," Clark explained. His commission has become increasingly busy in bringing film productions to the region. "Had this service been available a few months ago, I'm sure it would have been used for 'Marshall.'" NFTA officials say they spent 18 years pitching Jet Blue to add this route to its service in and out of Buffalo Niagara International Airport. Canadians have provided a great deal of business to Buffalo's airport in recent years. The direct service to Southern California could provide another incentive for travelers to opt for Buffaloover Toronto's busy Pearson Airport. The sagging Canadian currency may also influence those decisions. Niagara Tourism and Convention Corporation President and CEO John Percy says his agency is making a real push for travelers use the new service. "L.A. is a very important market to us in Niagara Falls because the last couple of years, L.A. has been in the top five markets where potential visitors call or contact us for information and materials on the destination." Travel writers are coming here to look at this region this week, because of the direct flight service.